My Interview for Friday Foodie by Polly Noble! I got some exciting news! A couple of weeks ago the wonderful Poly Noble from Polly's Path to Health and Happiness ask if she could interview me for Foodie Friday. For me this was such an honor as other Friday Foodies on her site are among my greatest sources of inspiration and are all women who make a living off stimulating a healthy lifestyle! So of course I'm also very proud that she asked me! I'm just a 26 year old girl from the Netherlands who tries to inspire others with healthy recipes besides finishing my PhD. But in just 6 months my blog has grown, and still is growing every day, and I feel blessed by all the beautiful people I encounter on this path. It's such a great community to be part of! Well back to the interview, Polly asked me a lot of fun questions but also some more difficult ones but I'm very pleased with how it turned out and it really reflects my way of thinking about healthy living, but also my personality. So if you want to get to know a little bit more about me, who my dream dinner guests are, what my favorite quote is, what my average intake of food a day is and many more, check out the complete interview on her website: Friday Foodie: Healthy Living In Heels & Coconut Chocolate Pancake Recipe! And yes, there is also a very very very delicious recipe on there: my coconut-chocolate pancakes! This recipe is not yet available on my blog so go check it out as it's one of my favorites! And for my Dutch readers, from this week on I will write a guest blog each week for the Dutch website: Goed Eten Gezond Leven! 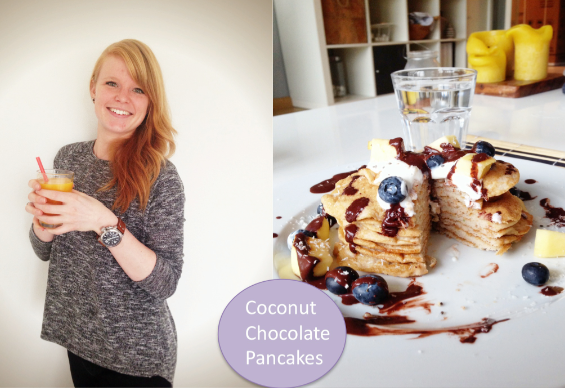 And the first recipe are the same coconut chocolate pancakes, but in Dutch! So be sure to take a look at their website too because they post a lot of informative posts as well as delicious recipes! It's Friday, so I'm working from home today and last week when I was searching for new recipes I came across a healthy version of a vitella tonnato, namely a pollo tonnato. So with chicken instead of veal. Wrote the idea in my recipe idea book and today I wanted to have a nice salad but not one I usually have with me to work. And I noticed the pollo tonnato in my book so decided to make a salad of it! And Oh my.. This was soo good! It has quickly become my favorite lunch salad so far! The tastes are perfect together and very well balanced. Was feeling sad that my plate was empty! Puree all ingredients for the dressing in a blender or in a blender. Season with salt and pepper. Roast the pine nuts if you had not done during the preparations for this week this. Put the salad on a plate, cut the tomatoes into quarters and cucumber into small pieces and mix with the lettuce. Cut the chicken slices into strips and drape over the salad. Pour the dressing over the salad and sprinkle with the rest of the capers and pine nuts. Pureer alle ingrediënten voor de dressing met een staafmixer of in een blender. Breng op smaak met zout en peper. Rooster de pijnboompitjes als je dit nog niet had gedaan tijdens de voorbereidingen voor deze week. Doe de veldsla op een bord, snijd de tomaten in kwarten en komkommer in stukjes en meng met de sla. Snijd de kipfilet plakjes in reepjes en drapeer over de salade. Giet lekker veel dressing over de salade en bestrooi deze met de rest van de kappertjes en pijnboompitten. I was so busy with the EBook that I completely forgot to post by dinner! But here it is. Used some fancy chef tools (cooking rings) which I got for my birthday to organize the quinoa and doesn't it look great!? Pretty chef worthy in my opinion. Wanted to try out some new combinations, so instead of just having only quinoa I mixed in some pumpkin seeds and pomegranate seeds and seasoned with lemon juice and it was delicious! Way more taste than only quinoa. Also the combination of red and white quinoa is great! Wash the quinoa well and cook as indicated on the package. Clean the sugar snaps and cut off the ends. Also remove any wires. Cook for about 4 minutes until al dente. Rub the salmon with salt, pepper, thyme and 1 tbsp olive oil. Heat a grill pan over high heat and grill the salmon for about 3 minutes per side. Drain the quinoa when it's ready and mix with the pumpkin seeds and pomegranate seeds. Season with lemon juice and serve alongside the salmon and sugar snaps. Tonight was one of the few nights I didn't eat what I planned on my menu. And if you have been following me for a while you know I ALWAYS plan my meals! This helps me to stay on track and make sure I eat healthy and clean everyday because I have all the groceries necessary for the dishes at home. And I basically always stick to this menu because I do not want to throw away any foods. Yes sometimes I have my meal planned for Wednesday on Thursday and vice versa but that's okay. Another benefit for me from planning my meals is that it helps me make sure I have a varied diet during the week. So I usually don't have meat two days in a row but plan a fish or vegetarian dish in between. But tonight I just didn't feel like the noodles I had planned so I figured, well what other kind of dish can I make with the same chicken and vegetables but just without the noodles? A quick look in my freezer led me to find 2 whole wheat pita's left over from last Sunday's Pita Falafel and I immediately knew, yes this is what I have an appetite for today! So grilled the vegetables and chicken and these amazing pita's were born. Called them Grill Madness because basically all main ingredients in the pita are grilled. Hope you like them as much as I do! Put a grill pan over high heat. Meanwhile, cut the zucchini into thin slices and season with salt and pepper and lightly brush both sides with olive oil. Then grill a few minutes on both sides until they are soft and have brown stripes. Meanwhile, cut the paprika and chicken into thin strips. Grill the peppers first when the zucchini is ready. Mix the chicken with salt and pepper and paprika and a little olive oil. When the paprika is done you van grill them for about 3 minutes per side in a grill pan until the pieces are golden brown and cooked. Meanwhile, toast the pita bread in a toaster and slice the tomato. Fill the pitas with the tomato slices, arugula, zucchini, paprika and chicken. I choose to serve my pita's without sauce, but of course my homemade garlic sauce or a delicious humus are perfect. Time for a recipe completely by myself! And it is definitely one of the best recipes I tried in the pasts few weeks, absolutely delicious. Super tasty with only a few ingredients so I love it. Hope you do too! Cook the bulgur as directed on the package. Put the shrimps with the olive oil, 1 crushed garlic clove, the cajun spices and paprika powder in a bowl and let sit for 10 minutes. Then fry in a wok over medium-high heat until tender. Meanwhile, cut the paprika into pieces and put it together with the peas in the wok when the shrimps are halfway through. Mix the vegetables and shrimps with the bulgur when everything is done, sprinkle over the juice of half a lemon and add the freshly chopped parsley. Time for a new chicken recipe! I was getting a little bit tired of making the same chicken pieces every week with different seasoning in pasta or rice. Luckily I found the idea for these chicken rolls in a Dutch magazine from a Supermarket: de Allerhande. Made the recipe clean and healthy and served it with a salad with some vegetables. Absolutely delicious and also perfect for if you're having guest over! Heat up 1 tablespoon of olive oil and 1 crushed garlic clove in a large frying pan or skillet on medium to high heat. Thinly slice the onion and bake for a couple of minutes. Add the kale and bake for 3 minutes more. Gently slice the chicken lengthwise through the middle so you get two thin pieces. Put a piece of kitchen foil on top and beat flat with a frying pan. Put the kale mixture on top with some roasted pine nuts and roll the chicken and secure with a toothpick. Whisk the egg in a deep plate, then first roll the chicken through the egg and then through the bread crumbs. Heat the butter in a frying pan and fry the chicken in 10 minutes golden brown and cooked. During this time you slice the paprika and mushrooms and fry in a splash of olive oil. When it's almost done add the rest of the kale mixture and serve on top of the lettuce. I was loving the pita chicken kebab from 2 weeks ago! So I wanted to make another pita dish but this time a vegetarian one. So I tried to make falafel but not with chickpeas as with the spicy falafel wraps, but with peas and bulgur. And it turned out pretty good! Make the garlic sauce and put aside. Meanwhile, put the peas, onion, garlic, parsley, mint, cumin, basil and coriander in your food processor and mix until it's a firm puree. Add to a bowl and mix with te almond meal, baking powder, paprika powder, salt and pepper. Drain the bulgur when done and pat dry. Mix well with the peas mixture. Heat up a layer of olive oil in a frying pan on high heat. Make small (flat) balls and bake for 2 to 3 minutes each side. Meanwhile, heat up the pita's in your toasted and slice the tomato. Fill the pita's with lettuce and tomato and put the falafel in when done. Serve with the garlic sauce on the side. Kook de bulgur zoals aangegeven staat op de verpakking. Maak de knoflooksaus en zet apart. Doe ondertussen de doperwten samen met de ui, knoflook, peterselie, munt, komijn, basilicum en koriander in een keukenmachine en meng tot het een stevige puree is. Meng in een kom met het amandelmeel, de bakpoeder, paprikapoeder, peper en zout. Giet de bulgur af wanneer deze klaar is. Laat goed uitlekken en meng met het doperwten mengsel. Verwarm een laag olijfolie in een koekenpan op hoog vuur. Maak kleine (platte) balletjes en bak ze ongeveer 2 tot 3 minuten aan beide kanten. Verwarm ondertussen de pita broodjes in een broodrooster en snijd de tomaat in plakjes. Vul de pita's met wat sla en de tomaat en doe de falafel erin wanneer deze klaar is. Serveer met de knoflooksaus ernaast. When you think about clean eating this book of Jamie Oliver is probably not the first thing you think about. But, that's not completely justified. Basically all sauces are made by himself and he always advocates the use of organic products. What I really like about the book is that Jamie worked together with Laura Parr who is a nutrition expert and they made sure that all the dishes are healthy and that there is a good balance between carbs, fruit and vegetables, dairy products and proteins with the occasional treat because it's not a diet book but a cookbook. They even included a list at the end of the book in which the calories, amount of fat, sugar and proteins are specified. The book is divided into nine chapters with recipes of which 3 chapters are all about beef, pork and lamb. So no I don't cook a lot of things from these sections as I don't eat these type of foods, but why not replace the pork with chicken?! You need to be a little creative but there are also great ideas in this section so for me it's no problem at all! The other sections: chicken, fish, pasta, soup & sandwiches, vegetables and breakfast are a very good fit with clean eating! I'm especially a fan of the chicken section. It contains recipes with lots of flavors from different areas of the world so I love it! Of course he uses in general white pasta, flour and rice but you simply replace this with a whole wheat variant. As a bonus the pictures are absolutely amazing and make you want to eat the whole dish straight away! They look like you're on a dinner table and I love that he uses all sorts of dishes and wooden chopping boards. This makes the pictures come alive and make you feel at home. So on to the name: 15 minute meals. Does it actually take 15 minutes to make the meals? Yes, some do and if you make them more often you get quicker and quicker. But in general you spend about 20 to max 25 minutes in the kitchen. But I get how he thinks so now I usually only spend 15 minutes so that's perfect after a long working day. You are basically just multitasking during cooking and for me it works. The way the recipes are written is ideal! It's very organized and if you want to leave one part of the dish out you can see in one instant which ingredients you don't have to get because for each part of the recipe there is a separate ingredient section in the margin. The recipes are written in such as way that you can follow each step without having to think about what to do next. Everything is perfectly timed even if you're not that great of a cook. All recipes are in my opinion easy accessible and relatively cheap if you have all the herbs and spices in your pantry and that's what we all want right! So what else to say? Nothing much, just that I love this book and that it's a great source of inspiration for me and all recipes are very good combined with a busy workweek and can also be easily converted into single person servings. I've made a lot of recipes from this book so I listed them below. Oh and yes, I mark my cookbooks with postits for recipes I still want to make and recipes I have made and want to make again. Who of you also like this cookbook? I'm curious and love to hear your opinions! Of course I will start this new aspect of the book with the cookbook of which I've made the most recipes so far! Jamie Oliver is a great inspiration for me so I will start with Jamie's 15 Minute Meals. I was craving nutella so bad lately! Nutella was my favorite spread before I started eating clean so I really miss it sometimes. Yesterday I was at the organic store and the rice/hazelnut milk was on sale so the perfect moment for me to try it out and make Nutella Oats for breakfast today. And it turned out great! Put a saucepan on low to medium heat, add the milk, oats and raw cacao. Meanwhile, thinly slice the banana and put in the apan, with the exception of a few slices. Cook for 5 to 8 minutes while stirring occasionally. Turn of the heat and let it sit for a couple of minutes. Put the oats in a bowl and top with the rest of the ingredients en the banana. Zet een steelpan op laag tot matig vuur met de melk, havermout en rauwe cacao. Snijd ondertussen snel de banaan in smalle plakjes en doe, op een paar plakjes na, bij de havermout in de pan. Roer goed en laat zo'n 5 tot 8 minuten zachtjes koken waarbij je af en toe roert. Draai dan het vuur uit en laat een paar minuten wellen. The second post in my new series of blog posts about Superfoods is all about chia seeds. Chia seeds are actually the first Superfood I started with because they have a neutral taste which makes them perfect for just any dish. I like to add them to smoothies, smoothie bowls and on top of pancakes, but you can also sprinkle them over your salad. Chia seeds absorb water till about 9 times their weight which is part of why they give you a full and satisfied feeling. And as a bonus they hydrate your body in this way! To enjoy all the benefits the best you can do is to let them sit in a little bit of water for a couple of minutes before you use them so they can soak up the water and can be processed by your intestines without difficulty. Chia seeds originate from the Aztecs were they were one of the most important nutritional sources besides corn and beans. Essential fatty acids: Chia seeds contain up to 4 times the amount of fatty acids compared to other grains. Fatty acids are very important for our body as they play a big role in the function of our vital organs. They contain the highest percentage of omega-3 which is found in nature. This improves brain functioning, lowering cholesterol, increase your resistance and decreases the risk of cardiovascular diseases. In addition, the ratio between omega-3 and omega-6 fatty acids is very good, namely 3:2. Plant based proteins: This aspect of chia seeds is the main reason I use them, especially after my workout in a smoothie, they contain high amounts of proteins! Actually 23% of chia seeds consists of proteins. People who are allergic to dairy products like cow milk or gluten could easily use chia seeds as an alternative. Additionally, they contain all essential amino acids, which are also very well balanced with the amount of proteins, making them a very complete nutritional source. Vitamins, minerals and trace elements: Chia seeds also contain a great variety of vitamins, minerals and trace elements. Among others: vitamin B1 and B3, calcium, iron, magnesium, manganese, phosphorus and zinc. If you compare this with other products, chia seeds contain up to 6 times the amount of calcium compared to milk, 15 time more magnesium than broccoli, and 3 time more iron then spinach. Antioxidants: Antioxidants make sure that your organs and tissues remain healthy as antioxidants disarm the free radicals in our body and also prevent them from developing. These free radicals are one of the reasons that your skin and body in general are aging and of course this is something we all want to avoid! Additionally, by doing this antioxidants protect us against cancer and cardiovascular diseases. Dietary fibers: Dietary fibers are abundantly present in chia seeds making them easily digestible and promote a healthy food digestion and intake of nutrients. Additionally, these fibers make sure that carbs are slowly absorbed by your intestines, thereby preventing a rapid raise of your blood sugar levels. Store chia seeds in a dry and dark place and they will be preservable for years thanks to the antioxidants! Don't forget to read the first post of this series about Bee Pollen! Do you want to save me for later or share me with your friends? “PIN” me to PINTEREST or “SHARE” me on FACEBOOK, using the social media icons below (in the gray frame)! Time for a new couscous recipe! Used some left over vegetables and it actually turned out pretty good! It's going to be a busy week full of new opportunies so looking forward to it! Cook the couscous according to package. Mine only takes 5 minutes, so that's perfect! Thinly slice the carrots, heat up 1 tbs of olive oil in a frying pan on medium heat and add the carrots. Quickly slice the egg plant and zucchini and add to the pan. Season with salt and pepper en fry until soft. Meanwhile, slice the paprika and add with the mais during the last 2 minutes. Mix the vegetables with the couscous, add the sliced tomato cubes, crumble over some feta cheese and you're ready for a delicious meal! You are probably all familiair with my Fruity Pancakes! If not, that you have really missed out! The fruity pancakes will be part of my upcoming Ebook! It's finally almost there, and will be available within 2 weeks! I'm having a real fun weekend so far and today I'm going to Amsterdam with some friends, and finally had some time to sleep in this Sunday. So decided to make brunch! And what better than making my fruity pancakes with 2 kiwi's as part of my 14-Day Kiwi Challenge. Yum! Have a great Sunday everybody! First, mash the banana completely with a fork in a bowl until it has a somewhat smooth consistency. Then add the egg and cinnamon and mix well until it's a smooth batter! Put a large non-stick pan on low to medium heat with a little bit of olive oil. When the oil is hot add the batter to the pan with a small 'sauce spoon'. The pancakes need to be little to make sure they don't break! As a guidance: you can make 3 small pancakes in one frying pan. Bake for a couple of minutes on low to medium heat (not to high because then they will burn!) on one side and then gently flip them over and bake for another minute or two on the other side. When these are also done place them on top of the first batch. Add the quark on top followed by the freshly chopped fruit and shredded coconut. Prak de banaan helemaal fijn met een vork (ik vind op een bord het makkelijkst). Meng dan met het ei en de kaneel in een kom totdat je een redelijk glad beslag heb. Bewaar ze op elkaar op een bord met een kom op zijn kop erbovenop zodat ze warm blijven terwijl je de rest van de pannenkoekjes maak. Voeg indien nodig steeds een klein beetje olijfolie toe aan de pan. Wanneer alle pannenkoekjes gebakken zijn doe je per persoon een flinke lepel kwark op het stapeltje pannenkoekjes. Gevolgd door het fruit en de kokosrasp! I started the 14-day Kiwi Challenge yesterday with a Green Smoothie Bowl after my workout. Used 2 kiwi's instead of one. And today I decided to make a kiwi salad for lunch! Actually tasted pretty good and it also makes a very pretty plate as I might say so myself! I used a green and a sungold kiwi from Zespri and they are both high in vitamin C, dietary fibers, folate and potassium. But they taste different. The yellow sungold kiwifruit is deliciously juicy and has a sweet flavor with only a hint of sour. But the green kiwifruit is more firm and more sour, it actually has a balanced sweet and sour taste. So in my opinion, combined they are perfect! Cut the cucumber and cherry tomatoes and mix with the lettuce and dressing on a plate. Peel the skin of the kiwi's and cut them into slices. Place around the salad and finish by sprinkling over some sunflower seeds. Snijd de komkommer en cherrytomaatjes en meng samen met de sla en dressing op een bord. Snijd de schil van de kiwi's en snijd ze dan in plakjes en leg rondom de salade. Maak af door wat zonnebloempitten eroverheen te strooien. Today a dish recommended to me by a good friend from a Dutch website Keuken Liefde. It was delicious and super easy to make and really budget! When the rice needs another 15 minutes, you heat 1 tablespoon oil in a frying pan on medium to high heat, cut the onion into pieces and put it along with a crushed garlic clove in the pan. Fry for 3 minutes and then you can sambal, ginger and coconut blossom sugar and fry briefly. Meanwhile make the chicken stock and cut the ends of the beans. Then add the stock, the beans and santen to the pan, season with salt & pepper, stir well and bring to a boil. Then lower the heat, cover the pan and let the beans cook and thicken the sauce. This takes about 10 minutes. During the upcoming 2 weeks I will be taking part in Zespri's 14-day kiwi challenge! I received all the kiwi's I need today including some fun goodies of which one is actually pretty genius, an USB-stick that has the shape of a kiwi! How cool is that! You might wonder why I would participate in this challenge. Well research by the University of Otago has shown that eating two kiwifruit a day can improve a person's mood and enhance their energy levels. In short, normally healthy young men ate either two kiwifruit a day or half a kiwifruit a day during a six-week study period as part of a research study into the potential mood-enhancing effects of kiwifruit. The results showed that those who ate two kiwifruit a day experienced less fatigue and depression and felt they had more energy compared to the other group. As kiwi's are an exceptional source of Vitamin C the results appear to be related to the optimising of Vitamin C intake. Kiwi's contain more Vitamin C compared to citrus fruits like oranges and lemons. Additionally, kiwi's are low in fat and contain a lot more essential vitamins and minerals. Kiwi's only contain 60 calories per 100 g and have a low glycaemic index meaning that they do not rapidly increase your blood sugar levels, in addition they are high in dietary fibers making them the perfect snack. So I was challenged to see whether I would experience the same benefits and as I'm really curious to see whether it works I joined. The challenges requires me to consume two kiwi's everyday during a period of 14 consecutive days and at the end report the possible benefits I experienced during this period.Of course I would love it if you would join me in this challenge! Zespri Kiwi's are widely available so why not?! During the next 14 days you can expect some updates with fun facts about kiwi's and recipes to incorporate kiwi's in your daily diet because it would be a little boring to only eat them as a snack. And to be clear, no I won't eat only kiwi's during the day, I will supplement my meals with them and not replace them. In January a friend of mine celebrated his birthday and I met a friend of him who is into crossfit and paleo. She mentioned a Dutch side (http://www.lekkersnelpaleo.nl/) with lots of delicious recipes fitting a paleo diet. Tonight I finally had time to try out a recipe and it was delicious! I choose the baked sweet potato with Spinach and Minced Chicken because it's super easy to make and really liked the simplicity of the recipe. Made some small changes so here is my version. Preheat your oven to 225 degrees of Celsius. Prick several holes in the potatoes with a fork. Wrap them in a separate piece of aluminum foil. Put them in the middle of the pre-heated oven for 50 minutes. When the potatoes only need another 10 minutes in the oven you quickly cut the onion, heat up the coconut oil in a frying pan over medium heat and fry the onion with 1 crushed garlic clove for about 3 minutes. Then add the minced chicken, tobasco and other herbs and powders. Stir well and leave to fry. When the chicken is almost done you can add the spinach and let fry until it's wilted. Season to taste with salt & pepper. Remove the sweet potatoes from the oven when they are ready, cut them lengthwise through the middle open. Mash the middle with a fork and fill with the chicken spinach mixture. Put a little bit of garlic sauce on top of both and enjoy. For those of you who don't follow me on Instagram, a couple of weeks ago I discovered the best breakfast ever and since then I'm kind of addicted to it and it has become sort of my signature dish. Ladies, gentleman, be prepared because it's delicious and super simple! You just blend a banana with quark or Greek yoghurt and top it with Homemade Coconut Granola and any fruit you like but this combo with blueberries en white grapes is definitely my favorite so far. Through all the questions on my Instagram pictures I learned that quark isn’t well known outside Eastern Europe countries so here’s a short explanation: quark (I use ‘lean quark’) is a dairy product with a similar texture as Greek yoghurt, only a little thicker and richer in proteins. It is made by warming soured milk which is strained when the desired consistency is met. And no it’s not the same as cottage cheese, because this is made with rennet and has a more loose consistency. So if you are living outside of Eastern Europe, you can substitute it with low-fat Greek yoghurt. Simply blend quark with a banana in your blender and top with granola, blueberries, white grapes and bee pollen! Doe de banaan en de kwark in je blender en meng tot het een glad geheel is. Doe in een kom en top met de granola, blauwe bessen, witte druiven en bijenpollen. Time to make my first recipe from Jamie's latest book: Save with Jamie. I choose the pukka yellow curry, but I must say, after going through all the recipes I don't think it's all that budget. But we shall see after I made more recipe from the book! And I need to clarify something because I got some messages from followers who think I will only post my recipes in Dutch from now on. No of course not! I will post them in English as well as Dutch!! So everybody from all over the world has access to the old recipes as well as the new recipes! Cut the chicken into somewhat large pieces. Heat up a splash of olive oil in a frying pan, add the chicken, season with salt & pepper and cook golden brown of medium to high heat. Meanwhile, cut the onion, paprika and pepper. Peel the garlic clove and ginger and put 1/2 onion, 1/2 paprika, the garlic, ginger, chicken stock cube, red pepper, coriander stalks, agave syrup, turmeric and curry powder in your food processor and mix until it's a smooth paste. Get the chicken out of the pan when done, add the other 1/2 of the onion and paprika and cook for 3 minutes. Then add the curry paste and cook for another 3 minutes. Rinse the chickpeas and put in the pan together with the boiling water, tomato puree, coconut milk and season with salt and pepper. Give it a good stir, lower the heat and let it sit for about 15 to 20 minutes with the lit on or until the sauce has thickened. Serve with the rice on the side, some fresh coriander leaves on top and 2 lemon wedges. If it's too spicy add some yoghurt of quark. As you all know I live in the Netherlands and anyone can email me for a recipe request in Dutch. Lately I got a lot of requests and I discovered that about 50% of my readers are Dutch. That combined with the fact that my upcoming Ebook will also be published in Dutch and in English I decided that from now on I will also post my recipes in Dutch. The introduction text of each blog posts and the informational blog posts will only be published in English. But for all the newly posted recipes you can find a Dutch version at the end of the post! The most popular recipes already posted will be updated over time. So a made an extra page listing all the recipes also available in Dutch: Recepten NL. Don't forget to follow me on Facebook, Instagram, Pinterest or Bloglovin! One of the first recipes I posted on my blog was my homemade granola and although this one is delicious I thought it was time to experiment with some other granola's. I've made a delicious cinnamon granola which will be part of my upcoming E-Book but I've also made this amazing coconut granola! So if you, like me, want some variation in your granola this is definitely one you should try out! All nuts you use need to be unsalted and unroasted! And something new on the blog especially for my Dutch readers! From now on you will find the newly posted recipes also in Dutch at the end of the blogpost. I will update the most popular previously posted recipes too, but not all of them. Hope you like it and don't forget to let me know if you liked the recipe when you tried it! Preheat the oven to 175 degrees of Celsius. Put the almonds, hazelnuts and walnuts on a clean towel, fold and crush them with your dough roller. You can also do this with a mortar but this is more time consuming. Put a frying pan on low to medium heat and melt the coconut oil. When it's melted, remove from the heat and stir in the rice & agave syrup and when it's well mixed add the vanilla extract and give it another good stir. Mix the oat flakes, quinoa flakes, shredded coconut, crushed nuts, almond flakes and all seeds in a bowl. Pour over the coconut oil-syrup mixture and make sure everything is covered. Spread the mixture out on a baking sheet with grease proof paper and put in the oven for about 25 minutes. Stir halfway through and check after 20 minutes to make sure that they don't burn. The mixture is done when it's golden brown. Remove the baking sheet from the oven and let the granola cool down. When cooled it will get very crunchy and it is possible that it sticks together. Simply break it with your hands and store in an airtight jar! Preservable for about 3 to 4 weeks. This Saturday started with a rainy and cold bootcamp. But we did it! Afterwards I did all my groceries, watched Sven Kramer in action at the Olympics and went to the movies with a good friends. She stayed for dinner and I made these absolutely delicious chicken kebab pita's. So yummy! Perfect food for the weekends. Although.. I made my own garlic sauce, and I'm going to a party with my brother tonight in Amsterdam (Qult) so I apologize in advance, because yes, I stink. Put the mayonnaise in a small bowl and mix with 1 crushed garlic clove and the fresh parsley and set aside. Thinly slice the chicken and mix with the kebab spices and olive oil in a bowl and let it sit for a couple of minutes. Meanwhile slice the onion and paprika and put a frying pan on medium to high heat. Then add the chicken and bake for 2 minutes. Then add the onion and paprika and bake until the chicken is done (takes about 5 to 8 minutes more). Season with salt& pepper. Meanwhile roast the pita's, put some spinach and sliced tomato in them and te chicken shoarma. Put some sauce on top and enjoy! Time for soup! Usually if a need carrots in a dish I only get 2 or 3 at the market. But this week he only had bags so I figure well why not I will think of something to do with the rest of the carrots. So eventually I decided to make a carrot soup with it. It was delicious! I made it somewhat thicker but if you don't like this just add some more water and put it in your blender. Cut the onion and slice the garlic cloves. Put a (soup)pan on medium heat and heat up a good splash of olive oil. Add the onion, ginger and garlic and sauté until soft for about 4 to 5 minutes. Meanwhile slice up the carrots. Then add the stock cube, water and sliced carrots. Bring to a boil and leave to simmer on low to medium heat for 10 to 12 minutes until te carrots are soft. Get the pan off the heat and puree with a 'hand mixer' or if you want a little less thick soup blend in your blender. Put the pan back on the heat, stir in the paprika powder and ground cumin and season with salt & pepper. Optional: Serve with some fresh parsley and a slice of spelt bread. Yesterday I made a delicious Creamy Tuna Pasta for dinner before my workout. Loving my new fitness schedule by the way. Focusing on my core so I get ready for 9 days of surfing during the first week of April in Rio de Janeiro! But I had tuna left over because I only used half a can so decided to make a tuna salad for lunch today, Don't want to throw away any food. Just put in other stuff I had left over from this week, but it turned out delicious!! Especially due to the mayonnaise dressing. Yum! For the dressing: 1 heaped tbs organic mayonnaise, 1 tbs white wine vinegar, 1 ts extra virgin olive oil, salt & pepper. Put the lettuce on your plate. Cut the pickle and paprika into small pieces and the cherry tomatoes in four. Mix with the tuna and egg in a bowl. Add the ingredients of the dressing and make sure everything is covered. Put it on top of the salad and enjoy! Voor de dressing: 1 flinke el biologische mayonaise, 1 el witte wijn azijn, 1 tl extra vierge olijfolie, zout & peper. Doe de sla op een bord. Snijd de augurk en paprika in kleine blokjes en de cherrytomaatjes in vieren. Meng dit in een kom met de tonijn en ei. Voeg de ingrediënten voor de dressing toe en meng goed. Zorg dat alles is bedekt met dressing. Doe dit bovenop de sla en genieten maar! I'm really into creamy pasta's the last couple of weeks (Creamy Mushroom Pasta & Tomato-Cream Broccoli Pasta). Don't know why but it is what it is and they are healthy and delicious! This tuna variant is inspired by a recipe from a Dutch magazine from the Albert Heijn Supermarket: 'De Allerhande'. And yes, it was good and something different as I usually don't eat tuna with pasta. Quickly chop the zucchini, heat up 1 tbs olive oil in a frying pan and add the zucchini and some salt & pepper. Chop the onion and add to the pan with the zucchini. About 4 minutes later, when the vegetables are done, add the peas, capers and soy cream and cook for another 3 minutes on low heat. Add the tuna and let it sit for 2 to 3 minutes until everything is warm. Serve the pasta with the sauce and some freshly chopped cherry tomatoes on top and the grated parmesan cheese. Today I really didn't feel like having a salad for lunch so I took a look in my new refrigerator and I noticed that I had a lot of mushrooms left over and then it hit me, I was going to make a scrumptious oven baked mushroom baguette with a fried egg on top. And yes guys, it was really good and I'm so full right now. Really enjoyed this sandwich as lately I barely had bread. Preheat your oven to 220 degrees of Celsius. Heat up 1 tbs olive oil in a frying pan, quickly slice the mushrooms and bake them for 3 minutes. Meanwhile slice the tomatoes into four. After the 3 minutes add the fresh thyme leaves and tomatoes and bake for another 2 minutes. Slice open the bun and smear each side with pesto. When the mushrooms are done let them drain a bit in a colander. Then put them on top of the pesto followed by some grated cheese and put them in the oven for 8 minutes. When the buns only need 4 minutes in the oven, heat up some olive oil in a small frying pan on low to medium heat. Crack an egg and bake on one side until done. Get the buns out of the oven, put some arugula on top followed by the egg. Season with sea salt.